Bread omelette is a simple breakfast recipe and a best evening snack for the school going kids as well. Bread omlette is prepared with whole wheat bread and egg spiced up with some ground pepper. This dish is rich in fibre, protein and essential nutritions. Pepper adds some medicinal properties to the dish. Try this easy to prepare breakfast recipe and Enjoy Cooking!!! 1. Beat the eggs and add salt to taste. Mix well thoroughly. 2. Heat a tawa and brush with ghee. 3. Fry the bread slices and spread some beaten egg over the bread on both the sides. 4. 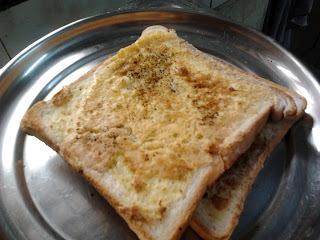 Smear ghee on both the sides of bread and sprinkle some pepper powder. 5. Remove from heat once the egg is cooked well.